This week, we’d like to help change the life of a 5 year old girl from Cheshire called Mary. Mary has a rare brain overgrowth syndrome which is life limiting – Mary is one of just 60 people in the world who have her exact condition. There is sadly no cure, only supportive measures. It causes Mary to have hydrocephalus (a build-up of fluid), which has required 5 surgeries on her brain. She also has polymicrogyria, which is an abnormality in the brain resulting in serious prolonged seizures. On top of this, Mary has a significant developmental delay which means she cannot walk, dress or feed herself. Mary's illness has had a big impact on family life. She is in and out of hospital for admissions or appointments constantly. 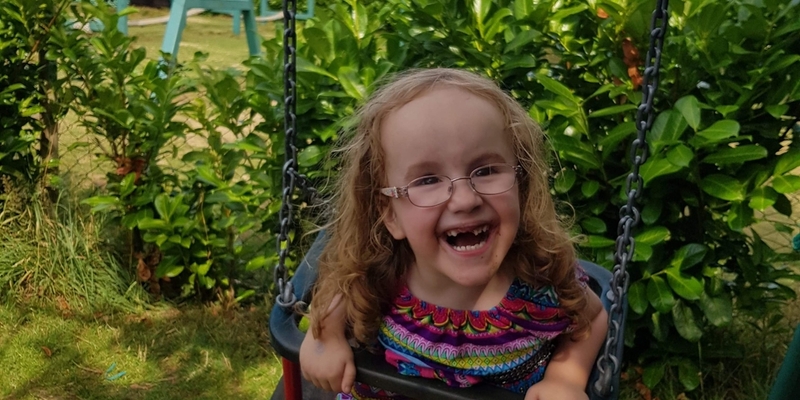 Mary’s parents have tried to organise some special things for Mary, such as days out or family holidays, but her illness has often prevented them from happening. Last summer, while they were on holiday, Mary had a serious seizure that required a general anaesthetic to get under control. It was a terrifying ordeal for the whole family. Mary attends a wonderful specialist school, which was a big step for both Mary and her parents. Mary’s mum and dad care for her on their own, and it took a great deal of trust to leave their little girl in someone else’s care. At home, Mary sleeps in what would otherwise be the dining room, along with her mum and dad. But they have just been granted funds to build a bedroom and wet room for Mary, which is great news, but part of these works involves clearing and knocking down an outhouse, and it is Mary’s mum and dad’s responsibility to clear it all and remove the rubbish. They have so much going on at the moment and have been so worried about how they’re going to get everything done...Mary has been unwell and in hospital again, and they also have young twins to care for, as well as Mary’s older siblings. So with your help, we’d love to make life a little bit easier for them. 1. Donations towards a skip / rubbish clearance - To make a donation, please click the link below. 100% of what you donate will be used to help this family. If we raise more than is needed for the skip / rubbish clearance, the extra funds will be used to help Mary and her family in other ways. 2. Tickets to Cbeebies Land at Alton Towers - Mary is a huge fan of Cbeebies, so we would love to be able to send tickets to her and her family. If you can help, please let us know by filling in the form below. 3. Messages for Mary - Mary is such a happy and loving little girl, despite everything she has to go through. We would love to be able to send her a big box of cards and messages to let her know there are lots of people out there who think she is amazing and who are wishing her well. To send a message, you can either write it in the form below and we will pass it along to her (your contact details will not be passed along), or you can post it to 52 Lives (Life # 199), PO Box 3154, Reading, RG1 9AT.